Horrible first and fourth quarters doomed the kinda-resting Spurs in a meaningless game. 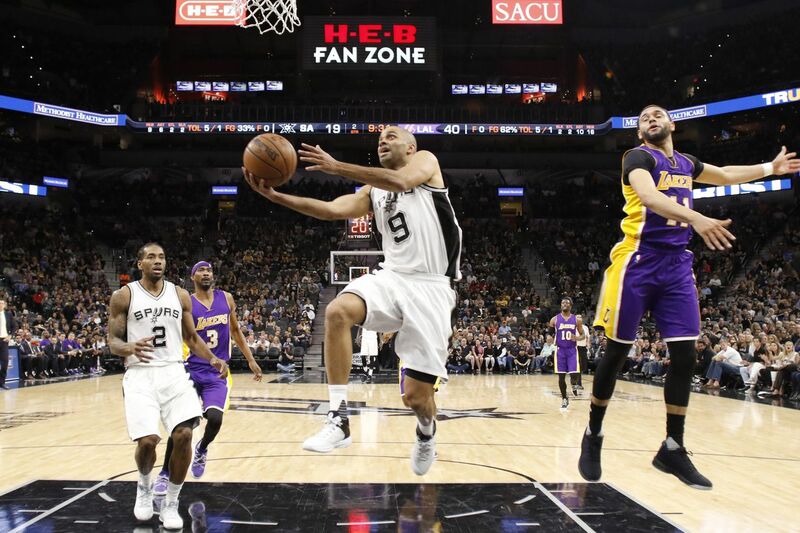 One night after beating the Memphis Grizzlies, the Spurs faced the Los Angeles Lakers on the second of four games in five nights. While Pop surprised almost everyone by starting his stars, he stuck to a minutes restriction in the second half. After getting down by as much as 40-14 early in second quarter, the Spurs slowly rallied back to tie things up in the fourth, but it would turn out to be too much for the role players to overcome on their own. The Spurs started the game looking like they had just played a tough, physical OT game 24 hours earlier. They were a step slow on both ends, missing some bunny shots, and generally not in sync. The Lakers led 14-10 by the 6:37 mark, and only added to that lead with a 17-4 run throughout the remainder of the quarter for a 31-14 lead. It was a quarter to forget as Brandon Ingram’s length gave the Spurs all kinds of trouble, and no one could get anything to fall on offense as they went without a field goal for the final 5:48 of the quarter. Spurs-killer Corey Brewer hit a three to open the second quarter, and the Lakers kept right on going with a 9-0 run before a quick 9-0 run by the Spurs, started by Davis Bertans dunk on the fast break, finally stopped the bleeding and got the Spurs back within 20. Led by some good effort on defense from Kawhi Leonard, the Spurs suddenly looked like they cared about the game as they slowly chipped away at the Lakers’ lead. A Patty Mills three with less than two minutes left got the Spurs within a dozen, and they entered the half at a manageable deficit of 53-41 after being down by as many as 26. Tony Parker started the quarter with a vintage spin move around Larry Nance, Jr., and he led the Spurs on a 20-6 run with eight points to get them within two (61-59) after just over five minutes. The Lakers got back up by six a couple of times, but Pau Gasol answered each time with an and-one dunk and three-pointer. Things stagnated a bit down the stretch as shots started clanking again whenever the Spurs went for the tie or lead. Metta World Peace made a rare appearance and hit a three to briefly get the Lakers back up by nine before a Jonathon Simmons three made the score 76-70 Lakers heading into the final frame. The Juice hit another three to start the fourth, and Bryn Forbes followed with one of his own to finally tie things up. The Lakers responded with an 11-4 run before a Bertans three temporarily slowed them down. The fourth quarter remained sloppy with Pop playing experimental line-ups and none of his top players. A Tyler Ennis three and David Nwaba dunk off a steal got the Lakers back up by 11 with 4:43 left. The Lakers stretched the lead as high as 15, and it looked like the Spurs were out of gas before they made things interesting by getting within five thanks to three-straight threes with 1:19 left. Unfortunately, that would be all the tired club could muster up, and they went on to lose 102-95. LaMarcus Aldridge and Leonard got the entire second half off, but Kawhi still scored 11 points to keep his streak of double-digit scoring games alive at 105. Parker also got the fourth quarter off after an impressive third quarter. The Spurs really need Danny Green and Manu Ginobili to get healthy. Pop has had to go with two-PG line-ups (including Forbes) too often lately, and it seriously hurts the defense. It doesn’t matter how bad the Lakers are or if Kobe Bryant is gone; their fans still show up in San Antonio (and probably everywhere else) in droves. Heck, I even saw a few at the Jazz game on Sunday. Here’s an idea for the league if it wants to limit wear-and-tear on its players and discourage resting: more of these types of back-to-backs and less of the two-destination ones that include traveling overnight. The Spurs return to action on Friday in Dallas to kick off another back-to-back. Good thing these games don’t mean anything.